Now, this is not a cheeky post, so don´t go thinking I´m talking about anything remotely naughty. We´re talking dried grapes, White Muscat to be precise. So, what is the difference between a Raisin, a Sultana and a Currant? This question came up after a recent post for Banana Bread. I had absolutely no idea so off I went to check. It seems Raisins are dried, seeded white grapes, usually Muscat. However, the definition I found says that they are oven dried, but more of that later. Sultanas are dried seedless yellow grapes and Currants are dried, tiny, black seedless grapes. Having mentioned that raisins are oven dried, I´m going to contradict myself. Malaga is famous for its raisins which are sun dried. In fact, close to where I live you can walk around some of the fields and still see the old style drying beds for the Uvas Pasas de Malaga – which is what this famous local product is called here. They are used to make the sweet Malaga wine, in delicious rum and raisin ice cream, in sauces made with the Malaga wine for savoury pork dishes, and are particularly sought after over Christmas when they are eaten with almonds, walnuts, cheese and typical sweet local pastries. So, when you´ve got a couple of vines dripping with more grapes than you can ever eat, what do you do? Big Man decided that if I could sun dry tomatoes, then he could do the same with the grapes. No, no…he didn´t need any help setting up the drying process – thank you very much. And anyway, the table I use in the garden for my tomatoes was being used for its preordained purpose. 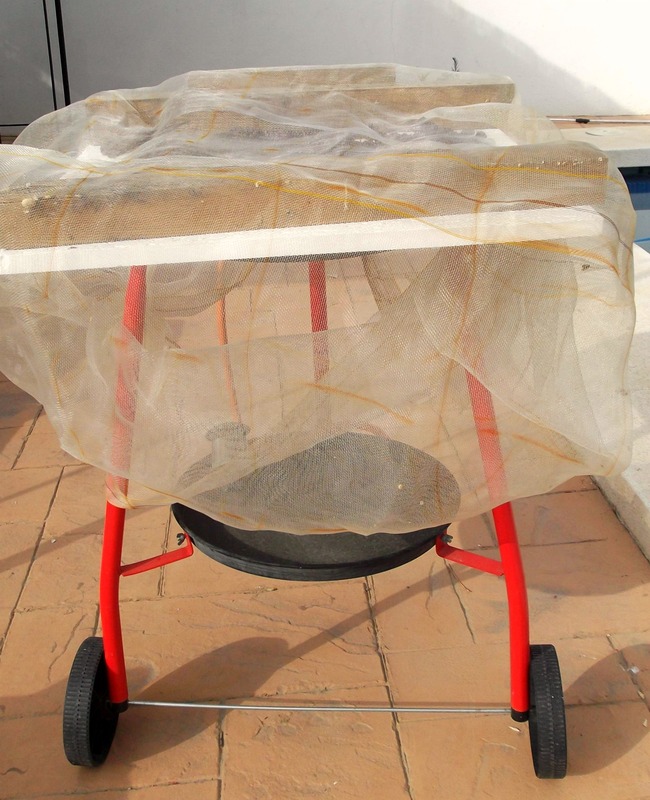 No problem, a spare bathroom ceiling tile from some recent DIY was propped on top of my paella burner, and together with a couple of blocks of wood, an olive net (to protect them from the flies) and some washing pegs (to stop the net blowing away) a makeshift drying table was fashioned. 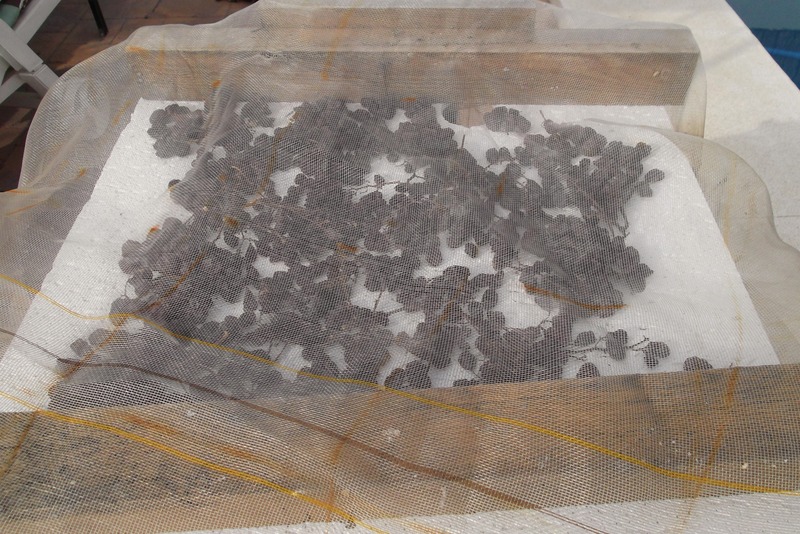 Who needs sophisticated drying nets when you´ve got top grade equipment like that?! And guess what? It worked! Six days of hot sunshine later and we have our first batch of Uvas Pasas. Not sure we´ll be able to hang onto them until Christmas, so as long as the sun shines, we´re planning on making a few more batches. 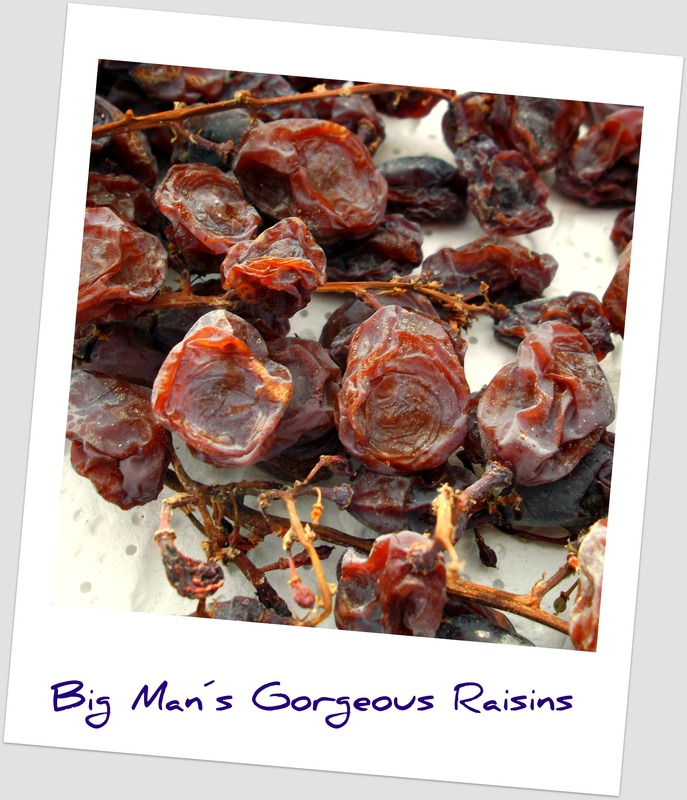 Big Man is justifiably proud of his raisins, but “shhh” – don´t tell anyone or they´ll all be wanting some. PS. For another wacky way of drying fruit, check out this amazing post over at And Then Make Soup – it goes to show that where there´s a will there is always a way. And a final PS.which is a big Thank You to Cecilia over at The Kitchens Garden and to Tandy at Lavender and Lime for passing on the Seven Links Challenge to me. To see how I responded and to check out some of my previous posts, take a look at a post I did a few days ago…I was lucky enough to also be nominated earlier by Karen from Back Road Journal. Your opening line gave me a good chuckle. Great way to use up the surplus grapes, too. But,let’s make something clear: no matter how cheap or appetizing the fruit, no matter how easy, no matter how tasty the end-result, I am not drying anything other than my clothes. Brilliant – very funny! Before you know it though you´ll be setting up drying equipment in your airing cupboard and posting recipes on it! Very interesting and brilliant photo! Thank you – am getting better with the camera (slowly)! Hi Chica! Big man is also a clver one I see. Great post! ¡Tengo un hombre muy listo! These look amazing! I am envious of your beautiful raisins. Mmmm, looks tasty! Not enough hot dry days here after the grapes ripen to sun-dry, but if I had Muscats, I’d find a way! Yes, you do need low humidity otherwise you end up with mouldy grapes…not so good! Do you get to France often then?…how lovely! Wonderful – follow the dream! Where there is a will, there is a way. I like the inventive drying area. The raisins remind me of when we were in Italy and went into the lofts of the barns where they were drying grapes for Vin Santo. A great opening photo…and please is it necessary to wait till Christmas to eat all that beautiful cheese and dried fruit and of course a glass of sparkling sunshine. What a magnificient array of uvas pasas! Horray to Big Man, have you thought of preserving them under aquavita? I´ve had a couple fo comments about preserving them and now I´m planning a little covert operation to pinch some to preserve…what a great idea! And I think you´re right…why wait until Christmas! I will – he´s very proud of his efforts..and I´m proud of him! I didn’t even have that thought in my head until you said that and then I could hardly read for laughing! Bottom line, raisins good, Big Man nothing wrong there. OK, then! I tried to translate this post to Big Man – some things do just get lost in translation…probably a good thing! Wonderful to have your own raisins – they look delicious. I’d never be able to keep them until Christmas. Well done, Big Man! We’ve done this with tomatoes but never had enough grapes….yet. I´m not so keen on the seeds, but becuase the raisins are big you can easily get them out. I don´t think this first batch will make it to next month, let alone Christmas! I hadn´t thought of it…but now you mention it, what a great idea! Been missing reading your posts. Our internet is down for 2 weeks, so I have popped round to my neighbours (to borrow theirs) to catch up on my blog reading. Love Big Man’s Raisins!!! What a pain for you – hope it gets sorted soon! I have never seen the process of making Uvas Pasas!! You are so lucky to have Big Man who did such a a marvelous job! These raisins look stunning, and I am already thinking of a delicious fruit cake you’ll be making for Christmas!!! I know, can´t wait but I thnk we´ll need to make more are these won´t last until then I´m sure! This is so funny, I have been taking pictures of grapes turning into raisins on the vines were we walk the dog. I don’t know whether they are doing it on purpose or if they are just too lasy to pick the grapes. Does Big Man know, would you dry grapes on the vine? I picked some vine leaves and blanched them yesterday, going to do stuffed vine leaves with raisins. That first pic is lovely!! Have checked with “the expert” and he says that usually they are dried ont he vine. Some people cover their grapes in paper bags to stop the birds or wasps getting to them but we have so many sparrows in our garden (they eat a lot of our chilli plant flowers at the moment the little devils) that we cut the grapes to dry them. Never thought of blanching my vines leaves….now that´s a great idea! Now that’s a winning post header! Definitely caught my attention and with further reading, you really had my interest in learning about the variety of raisins… I had no idea. Thanks for sharing informative tips. And by the way, I’m overly jealous that you have a paella burner!! Glad you enjoyed it. And the paella burner is a lot of fun – we can cook outside and it can take a HUGE pan (which is always a good think in my book)! To be honest, there aren´t that many left of the first batch! Well done Big Man! Now, what are you going to be making with them? Well, first we have to make some more but I´m thinking pasas soaked in anis, Christmas cake, mincemeat, on their own with nibbles……oh dear, make that several batches! Thank you – Big Man is feeling a little big headed today with all the compliments! Have just popped over to your blog and love those swordfih tacos!! Very cool post and props to the Big Man! M-mmmm, homemade raisins… They look delicious. I’m also one of those who can’t grasp the difference between raisins, sultanas and currants. Oops, is it necessary for raisins to be seeded? I seem to be misinforming my daughter. So it seems – I was surprised too as I thought it was all related to types of grape!